China has famously used its cuddly panda bears as a diplomatic tool, but to mark warming ties with Japan it is offering a distinctly more angular gift: two crested ibises. To some, the bird might not appear much of a looker: it has a bright red face with a long narrow beak that curves downward, and its eponymous crest resembles the wispy white mullet of an ageing rocker. But after Japan's last wild crested ibis died in 2003, rendering the species extinct in its homeland, the country has looked abroad to reintroduce the fowl. Visiting Chinese Prime Minister Li Keqiang is expected to sign a deal to deliver a pair of the birds when he meets with his Japanese counterpart Shinzo Abe later on Wednesday. 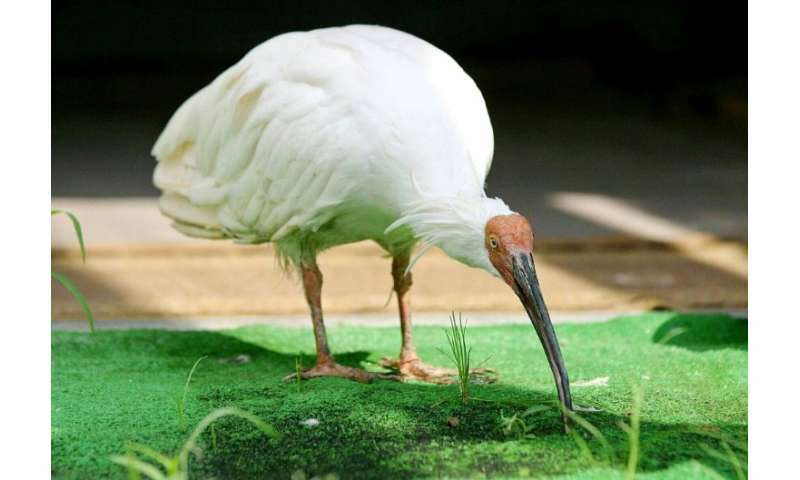 They will be the first ibis offerings from China in years, after Beijing began helping reintroduce the species to Japan with several donations over a decade ago. Japan is now home to several hundred crested ibises, descended from just a handful of gifts, but environmentalists fear that the population's undiverse heritage may leave it vulnerable to disease. The crested ibis has a storied history in Japan, appearing in artwork and literature going back centuries, and it was once so common it was even considered a pest. But it was heavily hunted for its white feathers and its meat, and even its designation as a protected species failed to stop development that wiped out its natural habitats. While the feathered gifts have garnered plenty of local media attention and will be warmly welcomed by conservationists, Japan will be missing out on a more iconic Chinese diplomatic gift. Local media reported that Japan was hoping Beijing would loan it several giant pandas for zoos in Kobe and Sendai, but an agreement was apparently not reached in time for Li's visit.